Bomberman and Splatoon had a baby and it turned to be a roguelike! Lead Berry the fairy towards the exit of the dungeon garden with a bunch of bombs to help you (or break you) in your way. Bombs can paint the ground, applying different status effects (good and bad) to the unaware. Excuse the lack on content and poor balancing and art, I ran out of time for them n_n. Currently playable on Windows and browsers. I'll try to get updated MacOSX/Linux builds by Monday. J: Place a bomb. They'll go off automatically as they move or if they get caught on the area of effect of another bomb's explosion. states. Chasing relies on some Dijkstra-based pathfinding, and I created the skeleton for a battle solver, currently handling some absurdly basic melee combat. 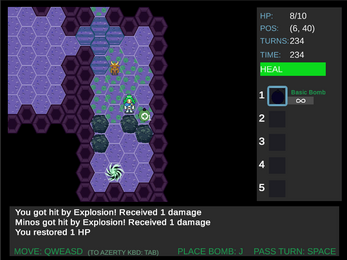 It feels quite one-sided against the player, so maybe I'll just go with bomber/static enemies.